One of the most enjoyable things I have done recently is to go on a foraging course. Through woods and fields, bewilderment turns to delight when you spot something you take a share of to eat or, later, to cook. 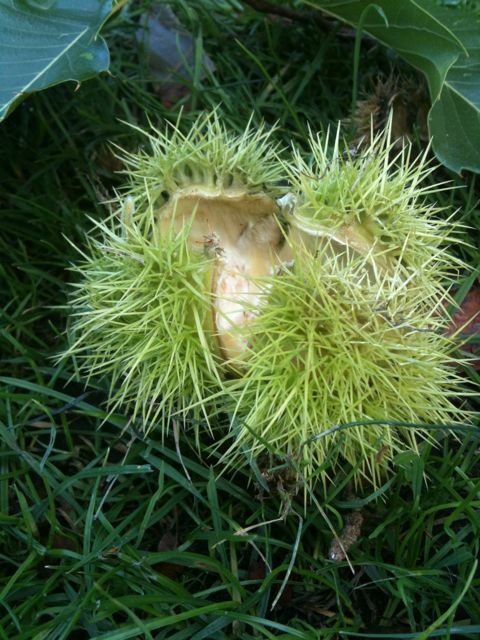 Finding fat chestnuts overlooked by the squirrels is a game good as any and I traded some in this week for Zena’s perfect autumn pumpkin and chestnut soup. Walking near Bury St Edmonds in Suffolk these last few days, with family and dog, I came across a windfall of green and rouged little crab apples. “Oh, look … Crab apples” I called out. Am reading George Orwell and hope one day to get through all his writing. The media has been full of the debate in the run up to spending cuts about what is fairness and how fair is Britain. It is a good debate to have. So we have launched a new economic indicator – ‘The Co-operative Barometer’ – outside the Stock Exchange which looks at what the public believe. Only one in ten people (10%) believe the distribution of wealth is fair. If you think that fairness is just motherhood and apple pie, try dividing up the pie unequally between children and watch what happens. We care about fairness and we also have an instinctive, though not always consistent, sense of what is fair or unfair. Two years ago today I gave a speech to NSPCC, calling for websites marketing to children to be classed as advertising and so subject to the rules of the Committee on Advertising Practice, and the Advertising Standards Authority. So much marketing had moved online that there is a need for the rules to catch up. I then wrote an open letter to the Advertising Association, naming Disney, Lego, Barbie and Bratz as sites that were breaking basic rules, such as not encouraging pester power. The Advertising Association, rather appropriately perhaps, got into childish strop and said that this kind of letter wasn’t fair. It is uplifting news then that this change has now been introduced and will come into force on March 1st 2011.
there’s been a lot of coverage of Luis Urzua’s first interview (the foreman of the Chilean miners) saying that the 33 miners survived because they debated and voted democratically and had a strong sense of solidarity. Good example of direct democracy in action of the kind many worker co-operatives use . . . The media are disputing the claims saying there was more division than his version implies. They are probably right, but again those who practice direct democracy (like co-ops) know that democracy is not always about a smooth consensus but argument, division etc. The Chilean miners show that direct democracy, however difficult, can work even in the most dire situations. So Consumer Focus and the Office of Fair Trading are both to go. These are no small changes and show no indication that this Government has ideas on how it hopes to promote the UK as a home for competitive markets rather than as a shelter for dodgy dealing. We are all worse off without you. We are often told that hard times bring forward the greatest innovation. It would be good if that were true, but if you are not sure, there is a great book coming that can help you. http://www.greenleaf-publishing.com/add_getquantity.kmod?productid=3300 looks at how local authorities can help to make the cuts that really matter – in pollution, carbon and waste.